Foosball is one of the more enjoyable table games, though it is usually better with more people when you compare it to some of the other choices like table tennis and air hockey. Another issue with trying to play this game is that you may not be willing to invest a significant sum of money in a foosball table in the first place. Of course, you can always decide to go to a bar or an arcade so you can fulfill the need for some foosball, but nothing beats having your own table. 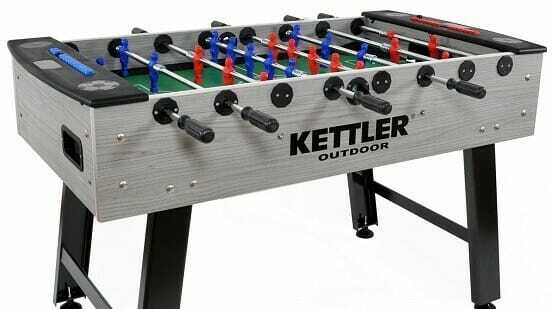 You have a few options when it comes to choosing a foosball table on a budget. First off, you can always opt for a cheaper model, but they have the issue of being less durable. 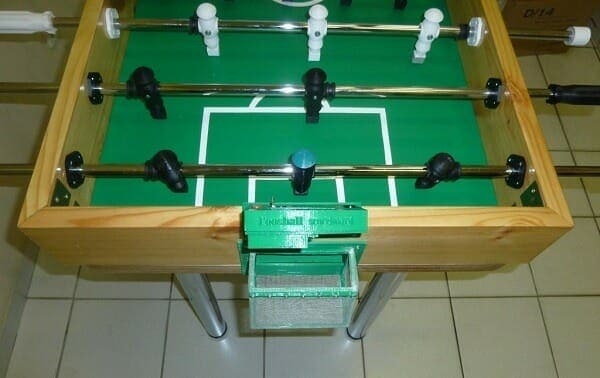 If you want your foosball table to last you a meaningful amount of time, then you will want to invest a little bit more money into it. One of the best options for those who would like a foosball table without too much of an investment is to build a foosball table themselves. Over the course of today’s guide, we will be taking a look at what you can expect in terms of a challenge when you decide to build your own foosball table. 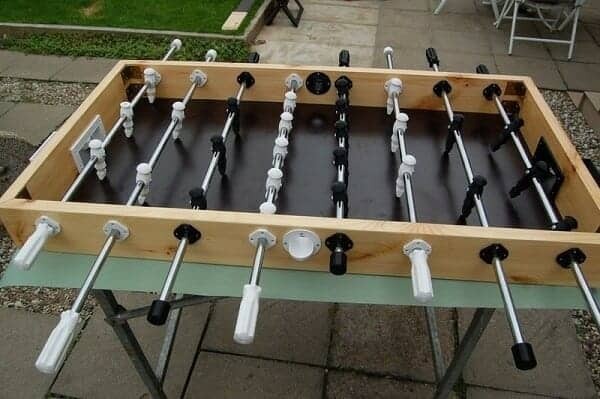 A DIY foosball table will not be as much of a challenge as you may expect, especially if you are a moderately skilled carpenter in the first place. Before we take a look at the specifics of how to make a foosball table, let’s go over some of the pros and cons of building your own foosball table compared to purchasing one. We’ll also be covering the materials that you will end up needing and the necessary tools. Many people wonder about the difference between making a foosball table and buying one, and there are quite a few of them. Of course, as we have already mentioned, one of the primary advantages of creating your own foosball table is that you will likely spend less money on it. This is not to mean that the opportunity cost of one of these tables is not higher, as it will be more time-consuming than just going out and buying one. In the end, however, if you are a skilled carpenter (whether by trade or by hobby), you can make one of these tables in relatively short order. If you enjoy woodworking, there is also the simple fact that creating your own foosball table is a fun, creative exercise, especially if you decide to take some liberties. While we will be presenting a relatively standard DIY foosball table in this guide, your imagination is your limit when creating yours. More skilled carpenters will be able to make more revolutionary foosball tables, and you might just end up creating something that is truly unique. As we already mentioned, these more advanced tables should only be attempted by those who are confident enough in their abilities with wood. While a DIY foosball table may not come with all of the amenities you can expect to find packaged with a store-bought foosball table, you will have the pride of knowing that you made it. This will give you a sort of home field advantage when you play your friends, as you will know the table inside and out. Keep in mind that the quality of your table will be directly linked to your skills with a drill, saw, and the other tools that you will have to use. How your DIY foosball table ends up is entirely up to you and your experience working with the materials that you will be making it out of. The first thing that you will want to consider when you are going to build your own foosball table is the kind of table that you will be making in the first place. Should you opt for a smaller table, it will be easier to make, but it will likely be able to support only two players and not the typical four. On the other hand, you can also build a regulation-sized table, which is the kind of model that we will be showing you how to create today. While this may present more of a challenge than a smaller table, it will also make for more exciting gameplay, and it will have more room for variation should you choose to customize your table. Many materials and tools are integral to the creation of a proper foosball table, and you will find that each one of them is crucial. In this section, we'll be covering the tools that you will need for a DIY foosball table as well as why you will end up needing them in the first place. Of course, the most important thing that you will end up needing for your foosball table is a suitable amount of wood, and the type of wood that you choose will determine the table quality. If you are an experienced carpenter, you can always resort to a solid, dependable wood like birch or oak. The outer walls of this foosball table will be made of wooden boards that you will need to cut to size, depending on the type of table that you will be making. The playing field will be made of another board that has been cut down to the right size, and you will want it to be about 1.5 inches thick. When choosing the wood for your playing surface, you will want something that is more durable than the more decorative wood that you can use for the exterior walls of the table. In the end, the type of wood that you purchase for your foosball table will depend on your budget and your preferences. You will also want to purchase an amount of felt that corresponds to the surface area of your DIY foosball table so that you will be able to cover the playing surface. If you don’t mind playing on the wood itself, then you can always forego gathering this material. Of course, you can’t forget to invest in players and a ball so that you can play foosball in the first place. If you are a skilled carpenter, you can try and fashion your players and your ball out of wood, though this will take quite a bit of effort and it will likely not be worth it in the end. Luckily, you will be able to find plastic players and balls available for a relatively affordable price, and you will be able to easily mount them to your DIY table. Should you try and make these parts yourself, we would argue that they are the most complicated part of the entire DIY process. 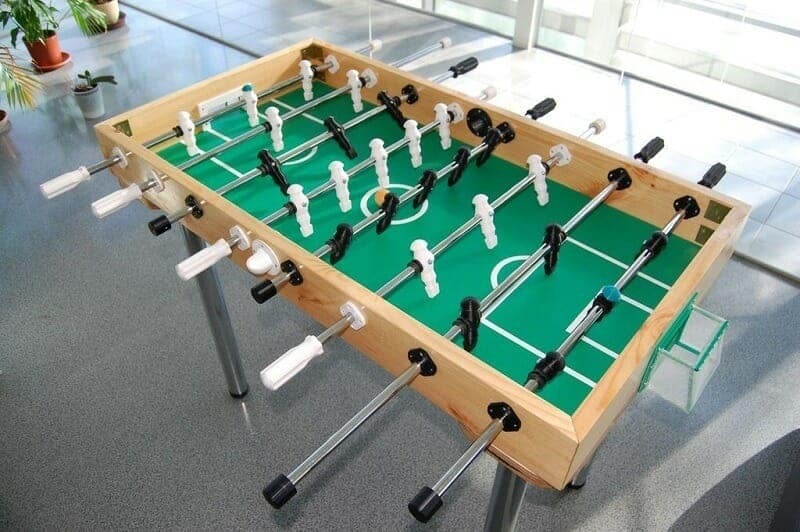 One other thing that you will need to make a foosball table is a suitable number of poles for the players. If you are making a small table, you may only end up needing to purchase four poles for two lines of players per side. If you are making a full-sized table, you will want eight suitable poles. We recommend opting for poles that are made out of metal as they will be easier to lubricate and they will be more durable. You will also need to purchase some plastic spacers so that it is easier to mount the poles in the wooden walls in the first place. Many will find it easier to use poles for legs rather than wood. If you are not confident that you can make stable enough legs, then purchase four additional poles. An essential tool that you will need to build a foosball table is a saw, and you can choose the type of saw that works best for you. While a manual saw will end up in more work for you, many carpenters prefer to take the hands-on approach whenever possible, and it certainly is in this case. Most of you will want to make the process relatively simple, however, so you can just opt for a standard circular saw, as you will not end up needing the precision of a bandsaw. Keep in mind that this project becomes much more affordable if you already have a circular saw in your shop. If you’re trying to put everything together and you want to make sure that it won’t fall apart, a power drill will be necessary. While you could theoretically use a hammer and nails to put everything together, the table likely won’t end up having the same tolerances as it otherwise would have. A drill will make things much easier for you, as you will be able to join the wooden components of your table together without too much of an issue. The first thing that you should do when starting any project is to measure out the dimensions of the wood that you will be needing. You will have to cut the playing surface down to a width of around 30 inches and a length of 56 inches for a regulation table. The walls will have to be cut down to a size of 52 inches in length and around 4.5 inches in height to ensure that you won’t have balls falling off of your table all of the time. The thickness of the walls is up to you, but you are better off buying thinner boards as they will be lighter and less strain on the legs. Once you have your walls cut to size, you will need to make evenly-spaced holes in the walls so that you can fit the rods through. The size of the holes will depend on the size of the rods that you purchased, but you will also want to leave room for the plastic buffer between the wall and the rod. Most of the time, the diameter of the holes should be around 30 mm. The next step is making the walls at the ends of the foosball table. These walls will have to be 30 inches long and 4.5 inches tall. You will also need to cut goals out of these parts so that you will be able to score in the first place. You will now discover why we cut our walls to be shorter than the playing field. On the other side of the goals, you will want to cut indentations into the playing field so that you can recover the ball after a goal. Next, you will want to cut further indentations into the underside of your playing field board so that you will have room to slot in the poles that will act as the legs for your foosball table. 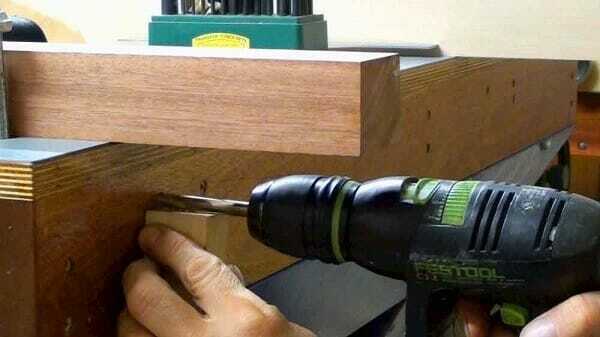 Up next, use your drill to attach the wooden parts, as you begin to see your foosball table taking shape. Add the felt to your playing field, and apply a coat of glue to ensure that it remains in place. You may now add the plastic spacers to one set of the holes that you drilled out of the walls of your foosball table before you slide through the poles and add your players to them. Once the players are on the poles, you can add a spacer to the other side and push the rod the rest of the way through before capping it. 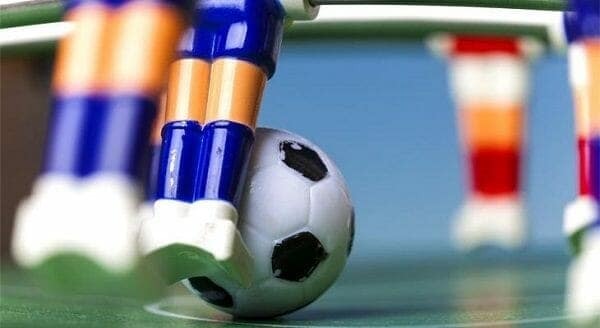 Attach the legs to your foosball table and test out the structural integrity. For a regulation table, the legs will have to be about 30 inches high as the rest of the table is around 6 inches tall, totaling the 36-inch height of a regulation model. Oil the spaces in between the plastic spacers and the rods so that your players will rotate more smoothly. Drop the ball in the center and try out your new table for yourself. We hope that this guide to DIY foosball tables has helped you decide whether or not this is the right course of action for you. While these foosball table plans may not be simple for everyone, they are still a fun challenge for those of our readers who love combining the hobbies of carpentry and foosball.